Do you realize there are all kinds of ways to express your creativity using web-based technologies? When you get right down to it, the possibilities are endless. Nowadays for any product idea you can come up with there is a way to fulfill your dreams using this type of technology. We are going to examine a few of these options right now. 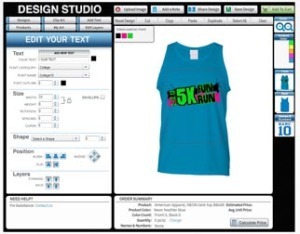 The first idea we will look at is designing a custom t-shirt or tank top online. You start with finding the perfect material for the t-shirt on your chosen website. You will then find on-site labs where you are involved with every facet of the designing process. If ideas are escaping you, the site will provide some to at least get you going. If you need further help, the site will typically have some templates for you to select from. If you need a lot of assistance in designing your tank top or t-shirt, each company has its own customer support staff available at the click of your mouse. Should you discover you truly enjoy this, you can sign up for your own account and keep returning for more. Another interesting idea for developing your creativity is to learn how to make electronic music using a computer program like Ableton.com. This is a music production-oriented website that allows you to do things like utilizing the audio sequencer that is playable in real time. It will sound like you are playing an instrument live. They have an extensive library of instruments you can select from that you can enjoy. You might even avail yourself of the various techniques associated with vocal or instrument performance. Not only will you be doing something helpful for your music career, but you will have fun at the same time. Do you need to brush up on your graphic arts skills? You can do that with programs like Adobe Photoshop. Adobe Photoshop has been in existence for 25 years with the future looking bright for another 25 years. Many people can attest to all of the great things to accomplish on there. You can excel in creativity when it comes to designing breathtaking images with this world leading photo editing software. These days; in addition to being able to do this on your PC, you can do it directly from your mobile device. Adobe Photoshop also features ways to organize and to publish your images once you are finished creating them. They continue to develop new versions of this software with brand new features as well as enhanced older features. This will make an already fantastic product that much better and more appealing to use. For more information or to order it, go to Adobe.com or you can also order it from Amazon.com. There is virtually no limit to how you can express your creativity using online technology. You can even start your own business as there is always a demand for customized products and services. If it is your dream to own your own business where you can be creative, now is the time to make that dream your reality.